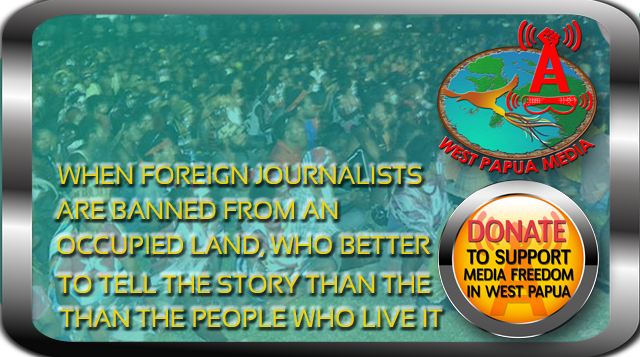 Deploring the fact that West Papuan people have been denied the right to a free and fair vote about their political future Khusta remarked that “in this day and age there is no room for any form of colonization or encroachment on a people. This discrimination is even worse when it is based on racism” he added. As leader of the United Democratic Front, a coalition of over 500 civilian based resistance groups aligned with the African National Congress, Mkuseli Jack demonstrated how the costs of apartheid could be transferred from the people of black townships to the commercial business community on which the support and revenue of the government partly depended. It was this strategy of withdrawing people’s buying power that alongside strikes by black workers and external sanctions by foreign governments, created the context for negotiations between Mandela and President F.W. de Klerk that finally brought the edifice of apartheid tumbling down. 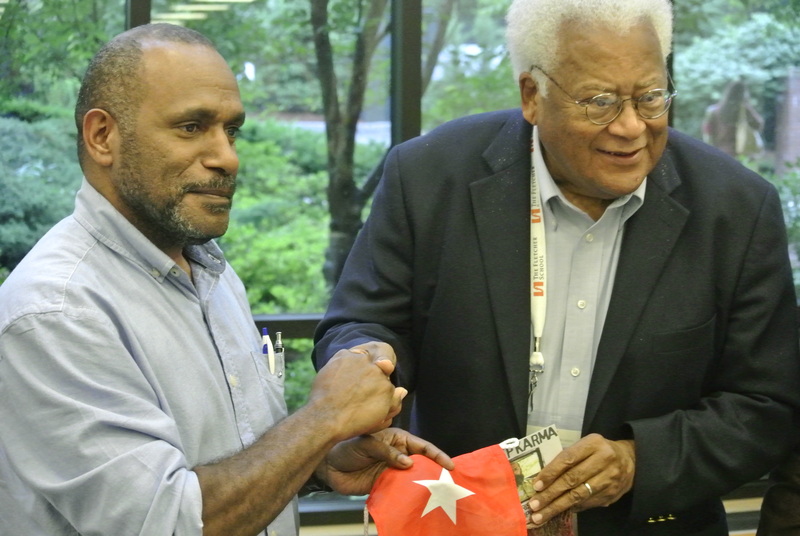 UK based West Papuan campaigner Benny Wenda meeting with Rev, James Lawson (25;00). Video from ICNC. In the late 1950s Martin Luther King Jnr. asked Rev. Lawson to travel to the South to help led the nonviolent struggle for basic rights that were then denied by the United States government. Rev. Lawson trained students from Nashville in the strategy and tactics of civil resistance. Lawson and the students successfully desegregated lunch-counters in the downtown area through determined nonviolent action. They then went on to organise other campaigns of the civil rights struggle. Evgenia Chirikova, the young Russian woman who co-founded Defend Khimki Forest, which has fought a long and so far successful campaign in the last ten years to prevent the destruction of an ancient-growth forest near Moscow. Oscar Olivera, one of the key leaders of the campaign in Cochabamba, Bolivia in the 1990’s that prevented the privatization of water resources and helped spark broad popular participation in Bolivia’s democratic transition in the ensuing years. Jenni Williams, the co-founder of Women of Zimbabwe Arise, who braved 52 arrests and gaolings due to ongoing protests for genuine political rights for all of the people of her country. The Lawson Awards are presented annually by the International Center on Nonviolent Conflict at The Fletcher School for Law and Diplomacy at Tufts University during the Fletcher Summer Institute. It is awarded to practitioners, scholars and journalists whose work serves as a model for how nonviolent change can be developed, understood and explained. Hat dies auf GO OKA WEMOHAWE rebloggt. This particular article offers in its wholeness the enormous amount of disdain directed to upon West Papua’s people by Indonesia’s President Yudhoyono. 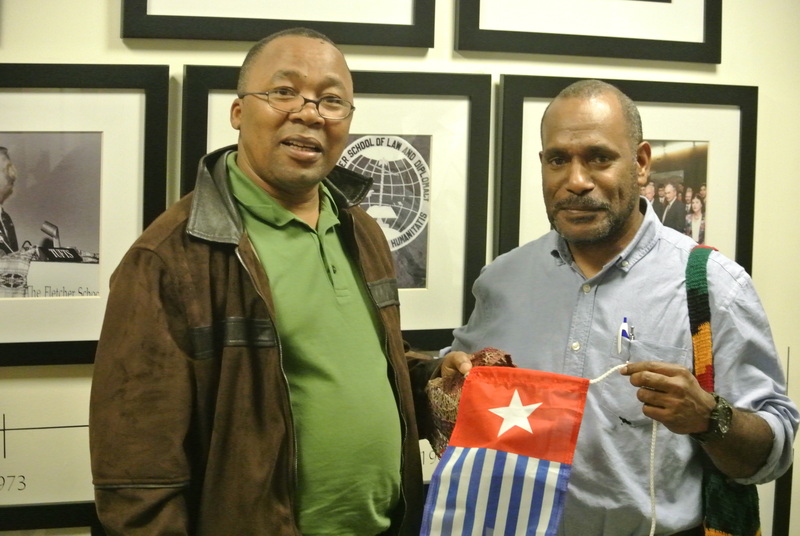 This man has become a master of deceptive dodging’s and detours in his purposes to ignore or even deny simple human rights to the West Papuan people that would prove far less costly than the cost of the military conducted intensive oppression and violence dished out upon the indigenous people in West Papua. The time is nigh when the entire of the Yudhoyono government be investigated for its serial engagement in broad-scale corruptions throughout both Indonesia itself and the many Melanesian island societies and communities that dwell throughout this expansive region of our World.